This is a fantastic addition to the David Bowie catalogue that many of us have collected over the years. 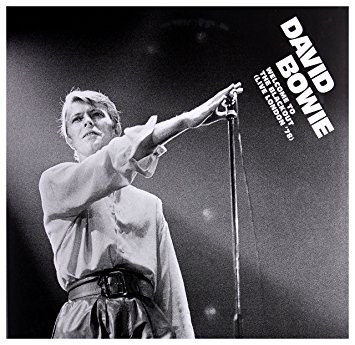 While I aways loved “David Live”, particularly in its latest Tony Visconti remaster, I feel that the recently released “Cracked Actor” is the far superior concert recording from that era, with the tension within Bowie’s band dissipating and they reach top form. The same comparison can be made between the original live recording from this tour, “Stage” and this newly released recording. While “Stage” in its recent remaster, is sounding at its best ever, this recording blows it away - vibrant, vivacious and full of vitality. The band are just superb. Adrian Belew’s guitar absolutely owns the whole album. Bowie sounds as if he is having a ball, as indeed do the whole band. It dates from early July 1978 and was the last night of the tour, whereas “Stage” was from April and May of the same year. The band seem to have really “upped it” just as the band did back in 1974 between July’s “David Live” and September’s “Cracked Actor”. The sonorous “Warszawa” is pretty much played as it was on “Stage” but a slowed-down, stately, magnificent “Heroes”, with a slightly different opening synth line in places, backed by an insistent piano, sets the tone for one hell of a gig. It is just inspiring, uplifting, beautiful. Great rolling drums on there from the wonderful Dennis Davis. The best live recording of “Heroes” I have ever heard. My goodness, we are only at the start of the show. “What In The World” is played at an absolute breakneck pace and almost sounds as if is going to fall off the edge of a cliff at one point, it is so frantic. Some far more noticeable backing vocals than on “Stage” and some stunning Adrian Belew guitar parts. “Be My Wife” has Bowie’s “mockney” hammy voice up to the max and some delicious electronic keyboard swirls together with some delicious bass. This is a musical revelation. Great stuff. Bowie’s voice has that soaring high pitched bit at one point and, again the guitar is just superb, cutting through the air like a knife. “The Jean Genie” has a livewire, affected, almost bonkers vocal from Bowie and the guitar is just exhilarating. “Blackout” is powerful, full of attack and verve. It almost gives the track a new life. “Sense Of Doubt” is suitably mysterious, full of clunking piano and weird creaking noises. “Speed Of Life” has all those sweeping synthesiser riffs that you would expect, and a big, rumbling bass, plus a few more additional noises not present on the original studio recording. Some great percussion on it too. Just a joy to listen to. “Sound And Vision” is in the set here (it wasn’t on “Stage”) and a stonking, captivating version it is too. The tracks from “Low” and “Heroes” just sound so damn good. They really do. “Breaking Glass” is next. Note perfect and a wired performance from Bowie. There is also an extended vocal/drum percussion bit at the end which gives the song even more appeal. The funk of “Fame” is so suited to this set. It becomes a celebration of electric funk. I can’t stress enough how good the man’s vocals are in this concert. If he’s on something it certainly has added something. He is hyped up and on top of things from beginning to end. “Fiiime” he intones joyously before launching into a madcap “Beauty And The Beast”, with Belew slicing open the Earl’s Court air with some searing guitar. So ends the “Low/Heroes” material section. Now for the “Ziggy” section. Dennis Davis’s drum sound out beneath the band intros and then we’re into “Ziggy’s” iconic opener, "Five Years". A lovely guitar from Carlos Alomar (I think) underpins the verses. Bowie’s vocal delivery is peerless. I am listening to this for the first time as I write. My God. It almost has tears in my eyes. This is just the dog’s undercarriage. Just listen to that swirling synthesiser. “Soul Love”, an underrated track, is played just a tiny bit too fast (maybe), but otherwise its lovely, with some great lead guitar and bass. “Star” is raucously punchier than its “Stage” equivalent, with a rumbling bass and some more guitar but the main riff is still played on keyboards, which was always a shame, but that was just the sound of the tour. Not so much with the punky thrash of “Hang On To Yourself” which jolts the corpse of Ziggy to rise from the grave. Full of electric vigour. Great noises at the end. Then it’s time for “Ziggy”, the synthesiser riff augmented by guitar, thank goodness, some delicious slowed-down guitar-driven bits. Majestic. Bombastic and brimful of confidence. The kids hadn’t killed this man. “Suffragette City” just kicks posterior, big time. Big, chunky guitar, almost as if Ronno is back. Listen to that Ronson-esque solo in the middle. Bowie heaven. Calm down the pace somewhat now, back to “Low” for the melodically mournful “Art Decade”, played to the high standard of all the other instrumentals. It actually sounds more interesting and beguiling than on the studio version. More background noises and percussion. Now, I have never liked “Alabama Song”, so I’ll not say too much about it, except the backing vocals are screeching, histrionic and irritating! Some no doubt love it, though. Nice solid bass on it, however. Some have found the “Station To Station” intro too bizarre, too many noises and so on. I love it. It is rowdy, clashing and loudly appealing. I would say that it goes on a little too long to the detriment of the song, though. When the familiar part kicks on it is powerful, thumping and dramatic. The same applies to an urgent, rocking “TVC15”, with some infectious wah-wah guitar and an addictive bass line. “Stay” is more rocking funk with another camped-up Bowie vocal. It morphs into a bluesy, laid-back, soulful “Rebel Rebel”. The cover has, I am sure, deliberately used Bowie in that controversial “salute” pose. Cheeky. Overall, what a truly wonderful release. Yes, I love the new remaster of “Stage”, but I love this more.